(16/51) TRENTON – Department of Environmental Protection Commissioner Bob Martin heralded the start of the Memorial Day weekend, the unofficial start of the summer season, by announcing a new, interactive public access map for visitors to locate more than 2,900 coastal, bay and river access points in four counties. Commissioner Martin unveiled the online map, which went live today, during the New Jersey Sea Grant Consortium’s annual State of the Shore event in Asbury Park, while welcoming residents and visitors to come enjoy some of the best water quality and beaches in the nation. “New Jersey consistently ranks as a national leader in ocean water quality and monitoring, and we expect another fantastic beach season for tourists, who will find beaches cleaned and ready for the summer,” Commissioner Martin said. The interactive map, which can be found at http://www.nj.gov/dep/cmp/access/ uses Geographic Information System technology to locate the 2,900 points and allows users to get a glimpse of a particular access point via aerial or street view. Additionally, every point features a pop-up window that provides a street address and amenities available at the location, including parking, handicap accessibility, restrooms, boardwalks and forms of recreation permitted. The information for each spot was compiled by DEP staff. Later this year, DEP will expand the maps to include all public access points in the northeast region of the state and the Delaware Bay and Delaware River. In 2015, monitored ocean beaches were open more than 99.9 percent of the time. Just two ocean beaches were closed all season as a result of exceeding the recreational bathing beach bacteria standard. 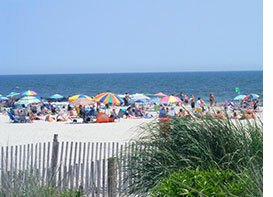 The DEP, working in partnership with local and county health agencies, monitors water quality at recreational bathing beaches from mid-May to the week after Labor Day. 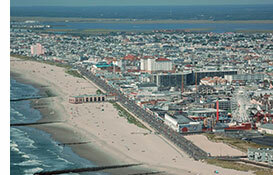 Water quality sampling results so far have shown that New Jersey’s beach water quality is outstanding. Coastal surveillance flights are also under way, taking place six days per week from mid-May to mid-September. These flights carefully watch for issues such as algae blooms or debris that might affect water quality. The website allows the public to easily view and download water quality data, notifies the public of any alerts at beaches, and shows the daily flight path and the chlorophyll data collected during the flights. It also includes access to a variety of reports, information about recent research, and shore-related links.